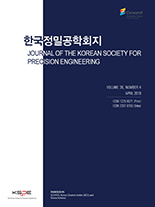 홍기연, 이동기, 김성동, 조영학,(2019).Micromolding in Capillaries와 Microtransfer Molding법을 이용한 역테이퍼 구조물을 가지는 이방성 소유성 표면 제작.한국정밀공학회지,36(4),413-418. Fabrication of inverse-tapered structure remains as a problem in the fabrication of oleophobic surface mostly due to the complications and the high cost of processes. In this paper, we propose a simple and low-cost fabrication method of inverse-tapered structured oleophobic surface using micromolding in capillaries (MIMIC) and microtransfer molding followed by MEMS processes. Silicon wafer molds for the formation of inverse-tapered structure were made using MEMS processes such as photolithography and anisotropic KOH etching of silicon wafer. The geometry of structure could be changed by controlling the etching depth of the silicon wafer mold. After covering the surface of the mold using flat UV tape, the formed space between mold and UV tape was filled with pre-cured PDMS by capillary force and then cured in oven. The tapered structure on UV tape was transferred and bonded to glass wafer by O₂ plasma treatment. The fabricated inverse-tapered structure was coated with a fluoroalkylsilane monolayer to reduce its surface energy. The wetting behaviors were investigated by the contact angle (CA) measurement of hexadecane droplets. This study demonstrates that an inversetapered structure can be fabricated on a substrate using micromolding in capillaries and microtransfer molding, whose surface shows the superoleophobicity.